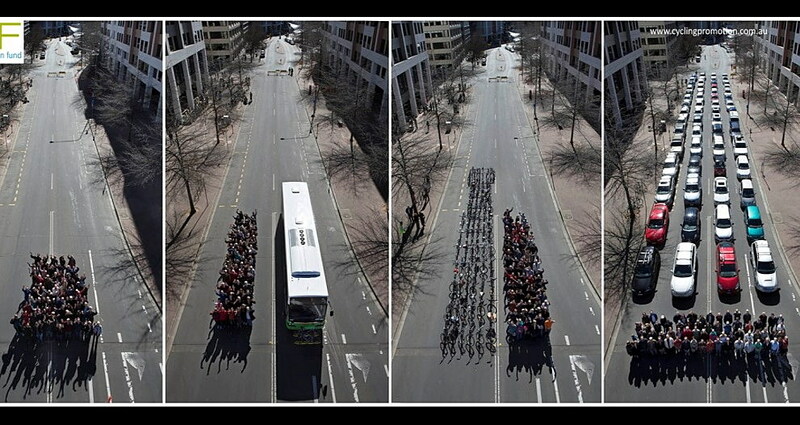 Focusing on moving people rather than moving cars allows us to better utilize existing infrastructure. Editor’s note: For the next several months, Sustainable Missoula will run a series of articles to build broader understanding of the 0/50/100 sustainability framework: Zero Waste, 50 percent sustainable trips, and 100 percent clean electricity for Missoula. This article is part 1 of a series on 50 percent sustainable trips. “The oceans are warming faster than we thought.” “Greenland’s ice is melting 4x faster than expected.” The climate change headlines just this week are terrifying. The scale and consequences of the problem are global and therefore paralyzing. How can we, as individuals or the community of Missoula, do anything to combat climate change? First step: breathe, relax. If you are even reading this column, you are likely already recycling and reusing, ditching the plastic bags and plastic straws. You maybe even made a New Year’s resolution to ride your bike more or take the bus to work. You are doing what you can in the ways you know how and that are available to you and that is great. In this four-part series brought to you by Missoula In Motion and the City of Missoula Transportation Planning Division, we are asking you to take a look at what transportation options are available to you, and why it is that way. Hopefully then you can join us in calling for more options, so that Missoula can actually build resiliency and meaningfully combat climate change. Transportation has become a leading contributor to climate change globally. Here in Missoula, personal transportation is identified as the No. 1 contributor of carbon emissions, responsible for 37 percent of the community’s total emissions, per Missoula’s 2016 Greenhouse Gas Emissions Inventory. Most of us don’t wake up every morning and think “how can I most rapidly accelerate climate change,” and yet our decision to drive for most trips is doing just that. What is frustrating, and makes us feel helpless, is that for many of us, driving is not a decision but a necessity. For the past 80 years, the growth of most American cities revolved around the personal automobile and Missoula is no different. Prioritizing the need to move cars rather than focusing on moving people led to the creation of highly inefficient systems characterized by unsafe “stroads” and sprawling development patterns. As a result of this car-centric development, the majority of Americans rely on a personal vehicle for most, if not all, local trips. We drive without any awareness that each time we climb into our cars we are making a choice, one with negative impacts on the health of our bodies, our community, and our planet. For many, biking, walking or riding the bus are not safe, comfortable or convenient. If they were, more of us would choose to travel that way. The system we have been operating within for the last three generations is flawed and needs to change. Advanced traffic modeling illustrates that adding and widening roads to accommodate projected growth in the next 30 years will actually result in higher levels of congestion than we have today. 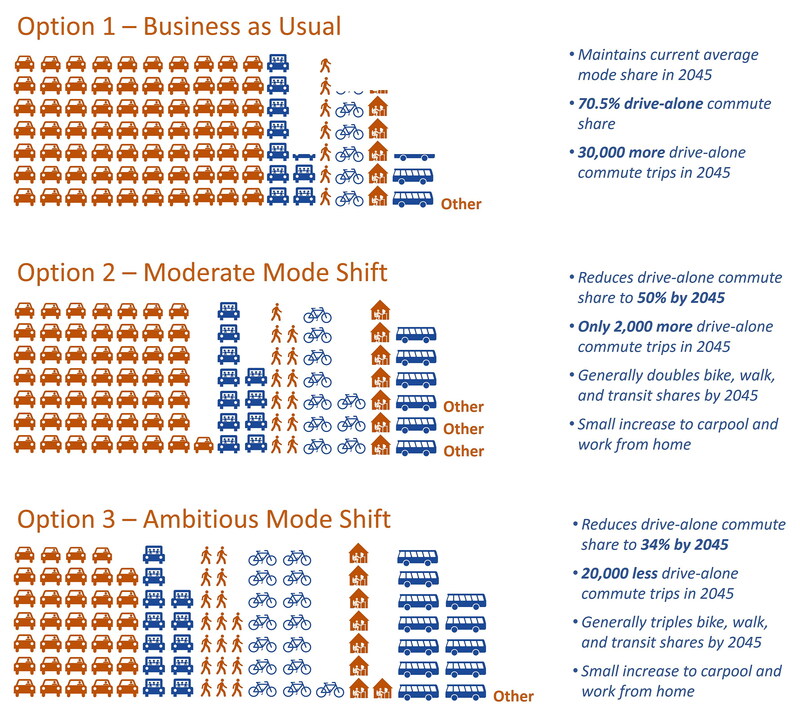 In the 2016 Long Range Transportation Plan, Missoula officially adopted the Ambitious mode shift option. Simply put, even if we had all the money in the world to build and widen roads, we cannot build our way out of congestion (nor would we want to live in a community that devoted that much real estate to streets and parking). As the Missoula community continues to grow, it is critical to build a system that supports mobility for all and expands the transportation options available to us. This new system must prioritize moving people rather than moving cars by reallocating resources to build better infrastructure for transit, biking, walking and ridesharing. It must recognize the importance of locating housing in close proximity to employment centers, health care, grocery stores, parks and schools. A sustainable and resilient transportation system must acknowledge that not everyone can or wants to drive and provide safe and convenient multi-modal travel options. And wouldn’t you know it, Missoula is already moving in this direction. City and county officials formally committed to shifting how we get around with the adoption of a mode split goal as part of the 2016 Long Range Transportation Plan update. This ambitious goal calls for roughly tripling the percentage of people commuting by foot and by bike, quadrupling the rate of people riding the bus to work and reducing the drive alone rate by half – all by 2045. Stating intent and adopting this goal, however, was the easy part. Now we need to make the changes necessary to see it come to fruition. Over the next few months, we will dive into the details of how Missoula can achieve these goals – from urban planning and infrastructure to outreach and education to policies and programs. Together we will create the new system in which our transportation choice will actually be a choice, one that can meaningfully address climate change. Katherine Auge is the Program Coordinator for Missoula In Motion. Ben Weiss is the Bicycle/Pedestrian Program Manager for the City of Missoula. January – all month long. It’s not too late to sign up for Missoula In Motion’s Clear the Air Challenge. Help keep our air clean during the month of January and earn prizes for logging sustainable trips! January 28. Montana Climate Action Collective meets. UM’s University Center room 207. All welcome. For info, contact Dan. daniel.carlino@umconnect.umt.edu. January 28. Missoula’s Mayor Proclamation supporting a US constitutional amendment that says corporations are not people and campaign contributions are not protected free speech. Citizens are invited to express their views. Missoula City Council Chambers, 140 W. Pine. 7 p.m.
February 4 – 15. University of Montana Commuter Challenge. Register your department today!